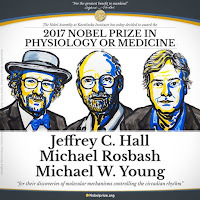 Nobel Prize 2017 in Physiology or Medicine was awarded to Jeffrey C. Hall (72), Michael Rosbash (73) and Michael W. Young (68) “for their discoveries of molecular mechanisms controlling the circadian rhythm”. It was announced by Nobel Assembly at Sweden’s Karolinska Institute on 2nd October 2017. Their discoveries explain how plants, animals and humans adapt their biological rhythm so that it is synchronized with Earth’s revolutions. Circardian Rhythm is 24 hour cycle in physiological processes of living beings, including plants, animals, fungi and cyanobacteria. It influences such biological functions as hormone levels, sleep, body temperature and metabolism. 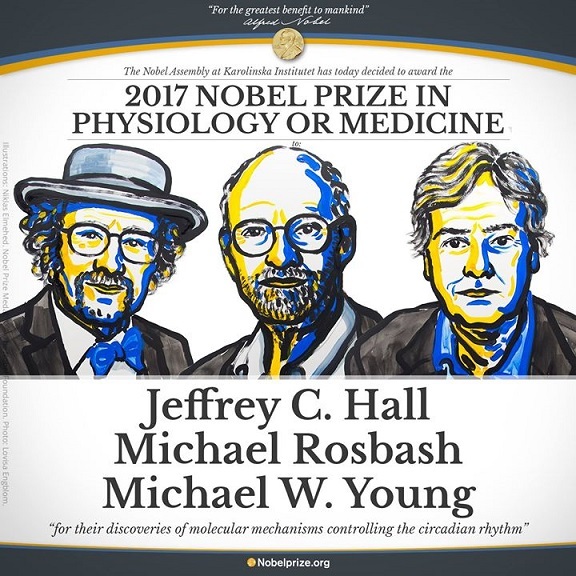 These three noble laureates dsing the fruit fly as a model organism, had isolated a gene that controls daily biological rhythm. They had showed that this gene encodes a protein that accumulates in cell during night and is then degraded during the day.